Our new labeling system will appropriately title your PCRecruiter tabs or windows in your web browser, allowing for an easier distinction between name records, company records, and other windows. The area to the right of the main Name, Company, and Position search boxes, which used to show your 10 most recently viewed records, now shows up to 50 records, along with the company and email address for names, and the company for positions. Use the dots or arrows to navigate, or click and drag. Watch for more enhancements to this area in later updates. Admin users may notice that the System menu has been reorganized. Most importantly the search box can now be used to find any and all items under this area. Resumes can be added and parsed through your mobile device’s native email client, creating new name records easily on the go. From within your device’s email client, locate an email with an attached resume that you would like to add to PCRecruiter. 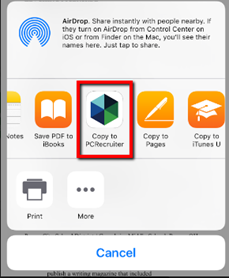 Click and hold the resume attachment until your device’s action menu appears. Inhale Resume: This option quickly parses the contact info and adds the record to your Default Company without any user interaction. Parse And Verify Resume: This option allows you to view, edit, and add to the record details before import, as well as specifying a Company, Position, and/or Rollup List that you would like to add the record to. To search for a Company record, select the menu icon from the top right corner. This will open your side navigation panel. Select Company, and then choose Search. Select the desired Company from the results list. 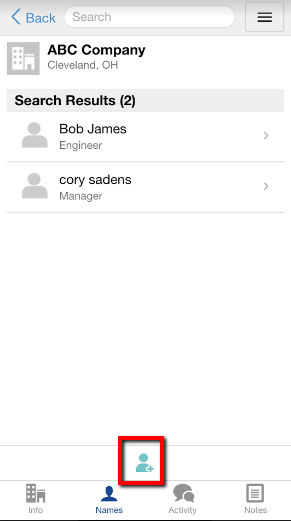 Select the Names option at the bottom of the window to view all contacts within that company. To add a Name select the Add Name icon at the bottom of the window, and then enter the specified contact information before saving your new contact.